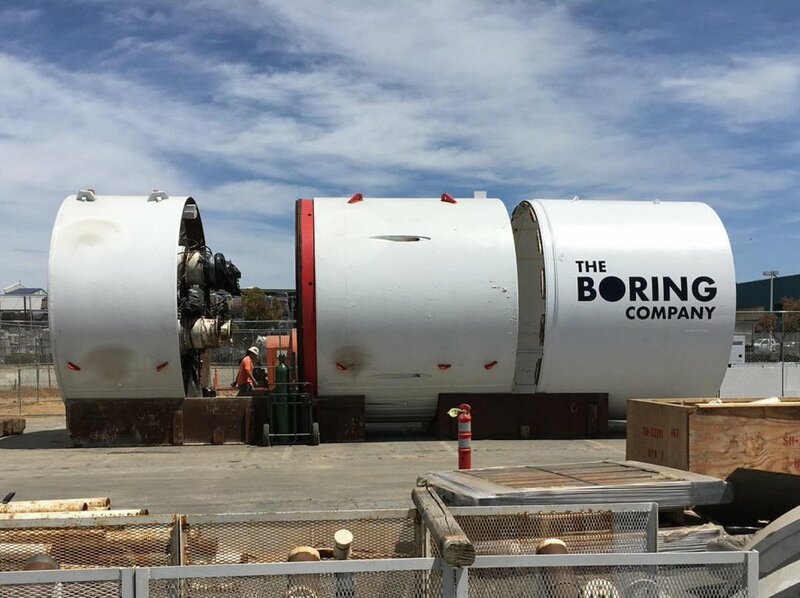 Elon Musk’s newest company, The Boring Company, published today a video presenting the particulars of how their system works. We can see these are not traditional tunnels, but a much more advanced idea. A network of tunnels underneath a city, with cars reaching them through special platforms that will lower vehicles from the surface level to a target tunnel. Next, the car is supposed to travel on a platform with a speed of 200km/h / 124mph. A few days ago a drilling machine was delivered to the SpaceX headquarters in Hawthorne, where work started some time ago to create a hole in the ground. A speed-up of around 18 times for boring is planned – from current 90 meters / 295 feet weekly to 1600 meters / 5250 feet, with additionally lowered costs. Musk plans to limit them through creating thinner tunnels. Autonomous platforms don’t need as much space like ordinary driven cars. The travel time, compared to surface transport, should be shortened around six times. On the video a mysterious vehicle can be seen, looking like a minibus. It looks similar to the platform that ordinary cars are supposed to drive onto, with the difference that it is completely glazed. It is probably an early concept of the announced beforehand in “Master Plan, Part Deux”, “a city vehicle of large capacity”. Elon Musk also told the first info about a truck designed by Tesla. It is supposed to be able to go long distances, not short, city-bound, as expected before. Additionally it is supposed to be pretty lively and driving it is supposed to be like in a sports car. Based on the picture we can see a stylized truck in a size comparable to ordinary ones. What is interesting, it does not use car mirrors. It is to be expected that it will be autonomous, which would drastically lower transport costs through limiting the role of the driver in the cabin. The official presentation of the new vehicle is supposed to be in September. Elon says the prototype is ready and has even driven test drives by itself. The CEO of Tesla also announced that the Model 3 should move to mass production according to plan in July. As for the autopilot, until the end of the year it should be able to drive company cars from Los Angeles to New York without any support of the driver whatsoever. This does not mean the driver can sleep while driving yet though – that is a level that will need more time. Musk is also planning to announce building two to four new battery factories this year, some of them being outside the United States, which will help with the company’s global expansion.